Welcome to Leaf and Grape’s first annual list for Top 10 Full Cigars. We decided to take a different approach with our “Best Of” lists. Instead of publishing one over-all list, we have 3 separate categories based on strength. While we try to be as mathematical and scientific as possible, we realize that rating and ranking cigars is a very subjective thing. Ask 10 people to give you their Top-10 list and chances are you’ll get a totally unique list from each person. That being said and without further adieu, we are pleased to present you with our choices for the Top 10 Full Cigars of 2012. 10. EP Carrillo Cardinal Maduro - Take a look at EPC’s resume and you’ll soon discover that they’ve been hitting home run after home run over the last few years. While I’ve been impressed with many of their existing lines, I have to admit their Maduros have always been lacking a little something. This year, all of that changes with the introduction of the Cardinal Maduro. A Connecticut Broadleaf wrapper against an all-Nicaraguan binder/filler is the backdrop for this cigar. Flavors experienced were sweet tobacco, dried fruit, coffee and chocolate. There were hints of pepper and spice that always remained in the background, but nothing that really presented itself as a true pepper-blast. I’m sure most of you are familiar with other EP Carrillo offerings like the New Wave Connecticut, Inch, Elencos and Short-Run series. 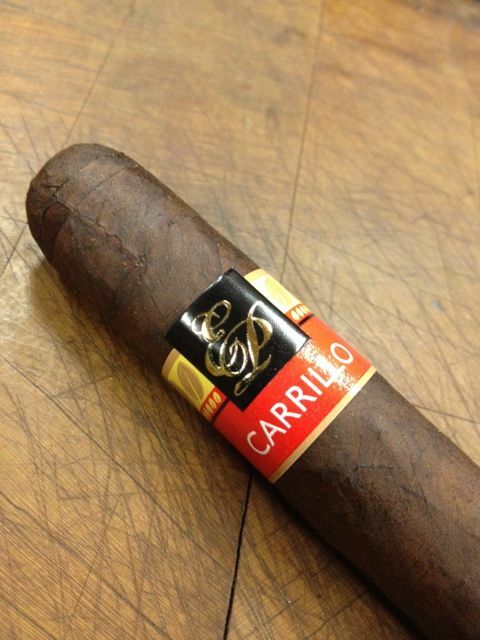 But if you haven’t yet sampled the Cardinal line, I highly recommend it – this Maduro is simply scrumptious. 9. La Flor Dominicana Oro Maduro - We first heard about this cigar at the annual IPCPR convention in Orlando this past August. Oro comes with a dark, rich Nicaraguan Maduro wrapper and Dominican binder and fillers. Each cigar comes in a gorgeous gold tube with black lettering, and the limited release cigar only comes in 5-count boxes at this time. Each and every cigar has provided a near-perfect smoking experience. Full of strength, full of body and full of flavor – this cigar is not for the faint of heart. Cocoa, coffee, nut and some fruit overtones dominate the palate. The burn produces a nice medium grey ash and the draw is simply flawless. If strong Maduro cigars interest you, this is a must try. 8. 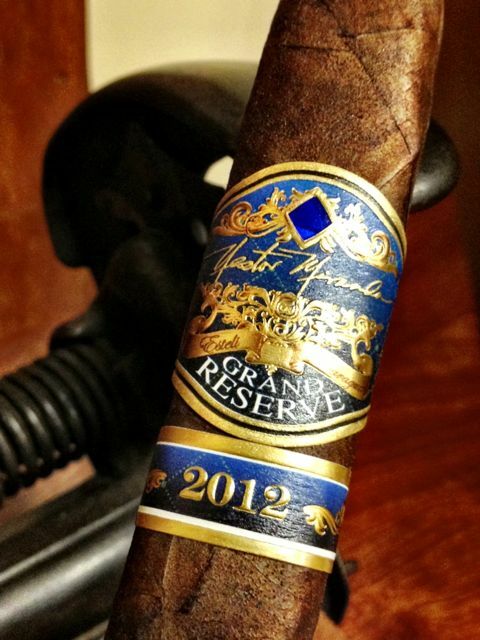 Nestor Miranda Grand Reserve 2012 – This is the sophomore release for Miami Cigar under the name Nestor Miranda Grand Reserve. The 2011 version contained a green and gold band while this year’s 2012 release is blue and gold. The cigar is still manufactured by the Garcia family at their Nicaraguan My Father factory. The box-pressed torpedo is simply stunning to behold. Coming in 10-count boxes, this limited release is sure to fly off the shelves from local B&M shops all across the country. 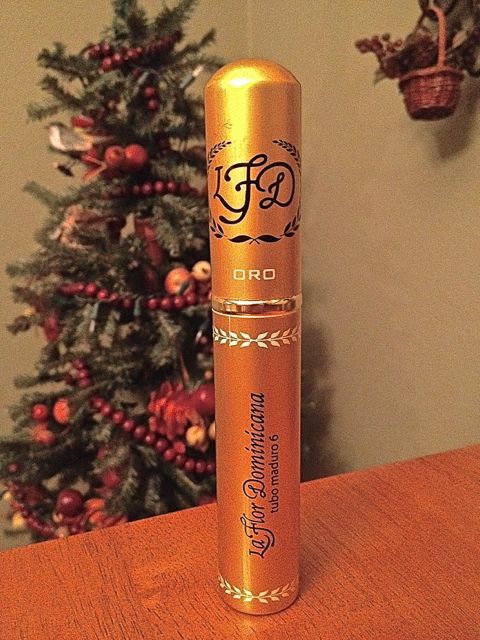 This cigar comes with an all-Nicaraguan binder and filler wrapped in a gorgeous Connecticut Broadleaf wrapper. Predominant flavors in the 2012 edition are coffee, mocha and pepper. This version is stronger than it’s 2011 predecessor, but it is also more flavorful. Grand Reserve produces a solid-white ash and a razor-sharp burn, which just adds to the overall enjoyment of the cigar. Not every local B&M shop will have these little beauties. But when you see them, be sure to give them a try – you won’t be disappointed. 7. 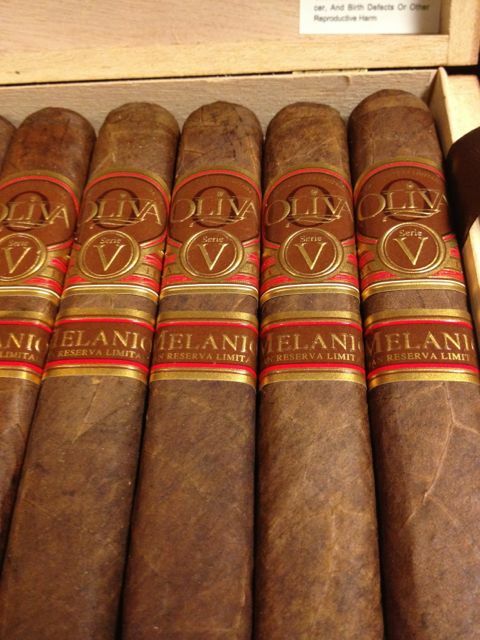 Oliva Serie V Melanio - This cigar is named after Melanio Oliva, the man who started Oliva’s tobacco growing in Pinar Del Rio, Cuba back in the 1880s. Unlike the original Serie V, Melanio trades in the Habano Sun Grown wrapper – replacing it with a Ecuadorian Sumatra wrapper to overlay the all-Nicaraguan binder/fillers. Predominant flavors are sweet tobacco, mild pepper, sweet spices and coffee. The texture and flavor of the smoke are rich and creamy on the palate as well. Hints of cedar come in during the 2nd half of the smoking experience – replacing the pepper and complimenting the other flavors perfectly. Melanio has another difference from its earlier Serie V predecessor – it comes in 5 different box-pressed shapes. Easily one of the best cigars of the year, I think Oliva will be very happy with Melanio’s end results. I can see people smoking this cigar daily – and not getting tired of its rich, complex flavors and excellent construction. 6. Intemperance BA XXI, by RoMa Craft - At this point in the game, RoMa Craft is probably more well-known for its CroMagnon cigar line. However, all that is about to change as news of Intemperance begins to sweep the nation. This cigar’s name is steeped in American history with the XXI referring to the 21st Amendment of the US Constitution – where the intemperance movement won out over the prohibition of alcohol. 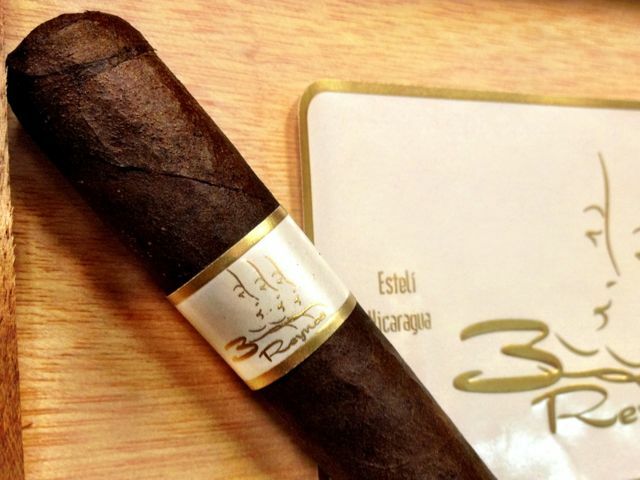 The BA in the name simply refers to the dark Brazilian Arapiracan wrapper used in the cigar’s construction. (a lighter-shade Ecuadorian version of Intemperance also exists) An all-Nicaraguan binder and filler rounds out the construction. Primary flavors consist of cedar, barn, earth and semi-sweet espresso. As the smoke progresses, hints of cinnamon and roasted almond join the profile replacing the earth and barn to sit alongside the espresso notes. Skip and Michael have really created a masterpiece with the Intemperance line. I fully expect to see these cigars popping up in local B&M shops all across the country. Roma Craft really has small batch boutique production down to a science – watch for this company to grow over the coming years. 5. 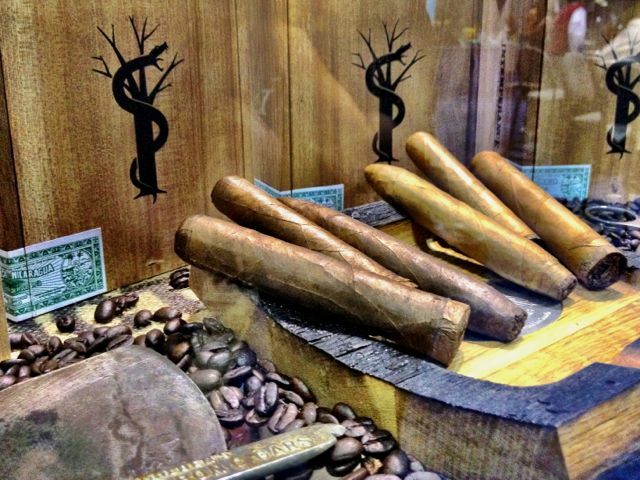 3 Reynas - This cigar was one of my favorites coming out of the IPCPR convention back in August. At the conference, the Quesada and Garcia families held a joint launch party showcasing the cigar named after their daughters: Janny Garcia; Patricia Quesada and Rachel Quesada. (aka, the three queens) When I spoke with Terence Reilly about the blend, it was clear to me this cigar would not be a light/mild cigar, but rather a full-bodied/full-strength smoking experience. Construction for 3 Reynas consists of a Connecticut Broadleaf Maduro wrapper coupled with an all-Nicaraguan binder and fillers. What you get with this cigar is classic Pepin to a T – the pepper and spice, the espresso and coffee, and rich earth tones mixed in alongside of leather and earth. One thing that really stood out for me with this cigar was how well-balanced all the flavors played off of each other. The MSRP is just right on this cigar, so buying a box will not break the pocket-book. All of these things add up to one fantastic cigar. I have smoked a number of these cigars – its complex enough to not wear out its welcome. It’s a rock-solid cigar that both Garcia and Quesada families should be proud of. 4. Liga Privada Unico Serie Feral Flying Pig - In 2009, Drew Estate released the very first Flying Pig – a 4×60 perfecto with a pigtail cap. That 1st Flying Pig was associated with the No.9 blend, but had an extra ligero leaf added to the filler for more strength. Since that time, we have seen other Flying Pigs come in to existence. This Feral Flying Pig is the 3rd in a series of 4 Flying Pigs created under the Drew Estate umbrella. (1 = No.9 Flying Pig / 2 = T52 Flying Pig / 3 = Feral Flying Pig / 4 = Undercrown Flying Pig) The No.9 Flying Pig was actually our #1 cigar of the year back in 2009. Since then, Liga Privada has been absent from our Top 10 lists…until now. 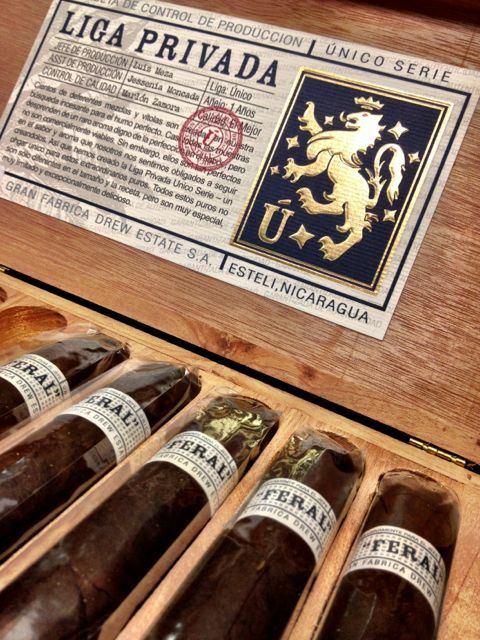 The Feral Flying Pig is bigger and bolder than any of the other Flying Pig offerings. Construction consists of a Connecticut Broadleaf wrapper, Brazilian Mata Fina binder, and Nicaraguan fillers. Initial flavors consist of a strong blast of pepper and spice up front. After that initial blast, the pepper subsides giving way to rich notes of earth, chocolate, espresso and cedar. This is one serious flavor bomb of a cigar. Smoke production is voluminous. FFP also has a great draw and a really good burn line. (difficult to achieve in the perfecto shape) The ash is grey and holds on to the cigar like Velcro – you literally have to flick it from the cigar, otherwise it isn’t moving. Quantities are hard to come by, so when you see them in stock – be sure to grab as many as your local B&M shop will allow. 3. La Aurora Preferidos Diamond - Many of you are familiar with La Aurora’s Preferidos line which consists of the following vitolas: Emerald (Ecuadorian); Sapphire (Connecticut); Platinum (Cameroon); Red (Brazilian Maduro) and Gold (Corojo). In 2012 the Diamond was added to the line. 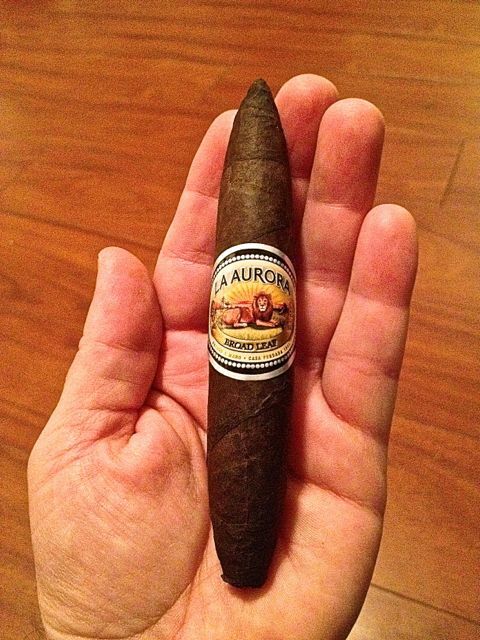 Consisting of a Connecticut Broadleaf wrapper, a Dominican Madura binder and all-Dominican filler this cigar is sure to change the way many of you think about La Aurora. This cigar is a full-bodied, full-strength cigar with a sophisticated flavor profile. Never too over-powering, just an extremely well-balanced cigar. Primary flavors encountered revolve around cedar, espresso and coffee with cream. As the smoke continues the cedar and espresso play off of each other for the remainder of the smoking experience. The Preferidos Diamond comes in an 8-count box, so supplies will be limited. However, that being said – this makes for a perfect special occasion cigar. Be sure to add a few to your humidor – trust me when I say you will not be disappointed. 2. 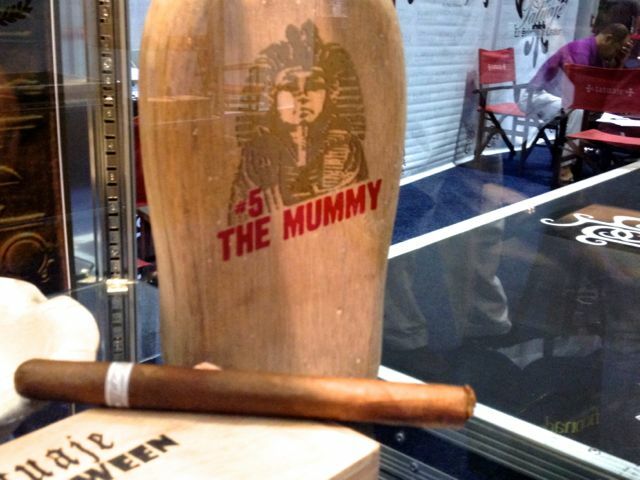 Tatuaje Mummy - Based on Tatuaje’s Private Reserve (aka black label), this cigar is an all-Nicaraguan puro masterpiece. The Mummy comes in one size, a 7-3/4×47 closed-foot Parejo. Using a medium-brown Nicaraguan Criollo Sun Grown wrapper and Nicaraguan binder and fillers, the Mummy is rich, complex and provides a sophisticated array of flavors for the palate. Primary flavors experienced were hay, grass, honey and herbal tea. As we continued notes of cedar, sweet citrus and leather replaced the hay and grass. Mummy is truly one of the most complex cigars I have smoked to date. The burn was exceptional, the ash a gorgeous light grey, and the draw was picture perfect. For those of you who prefer a smaller sized cigar, do not be fooled by the 7-3/4 inch length. This cigar smokes flawlessly and is a real treat. 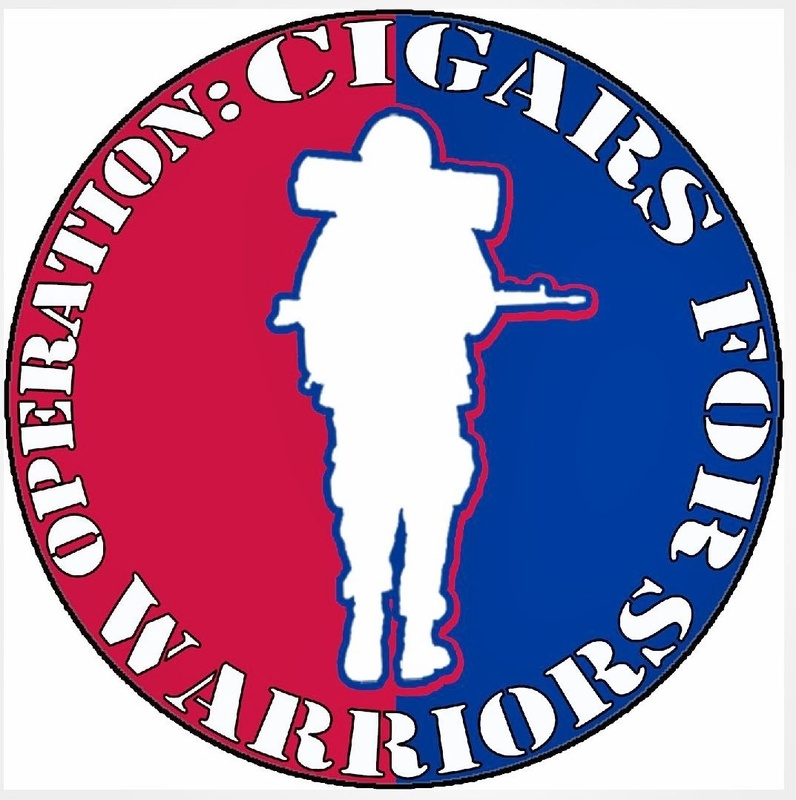 Quantities are limited to 3,100 boxes of 10 cigars per box. 1. Liga Privada Unico Serie UF-4 - My first experience with this cigar was back in 2010 when Drew Estate co-founder Jonathan Drew gifted me one from his private collection. At that time the cigar came in a simple white band with the letters “LP JD 4” emblazoned in black lettering. (JD4 referring to Jonathan Drew’s personal blend) Now fast forward to October 2011 when the vitola is officially made a part of the Unico Serie line as a retail exclusive for Casa De Montecristo in Chicago, IL. By that time, the name had actually changed from JD-4 to MF-4 to UF-4. The construction of this cigar is basically an amped up T52, containing the well-known Connecticut Stalk-Cut Habano wrapper, Brazilian Mata-Fina binder and a host of fillers from the Dominican Republic, Honduras and Nicaragua. What separates this cigar from the regular T52 blend is more ligero leaf being present in the UF-4 filler. Initial flavors experienced are strong notes of cinnamon weaved in nicely with pepper and other exotic spices. Further analyses reveal warm flavors of bitter-sweet espresso, cocoa, and rich earth tones that all balance nicely alongside the cinnamon and spice. 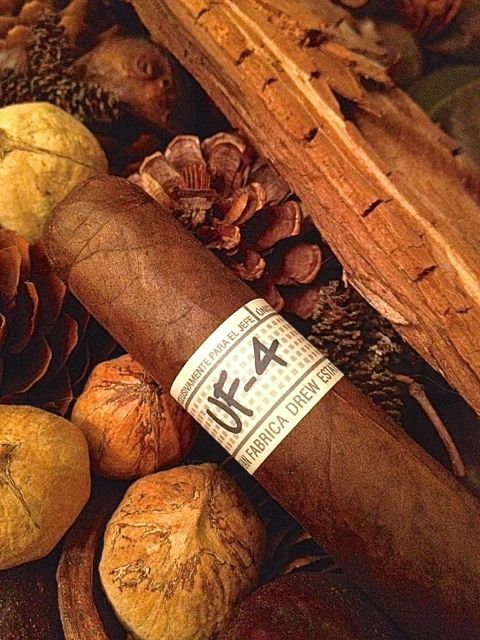 One of the more unique things about the UF-4 is this – while being an amped up, stronger Liga Privada – it happens to have a warmer, richer flavor profile. This really came as a surprise to me because a stronger cigar typically means a harsher or spicier cigar. This is not the case with the UF-4. I find this cigar to be the perfect cold-weather cigar due to the fullness of flavor and richness of the spices. Getting your hands on the UF-4 will be difficult. But when they’re available, they are simply one of the best cigars on the planet. This entry was posted in 2012, 2012 Top Cigars, Best Of, Drew Estate, EP Carrillo, Full, La Aurora, La Flor Dominicana, Liga Privada, Miami Cigar, Monster Series, MyFather, Nestor Miranda, Oliva Cigar Company, Quesada, RomaCraft, SAG Imports, Tatuaje and tagged Drew Estate, EP Carrillo, La Aurora, LFD, Miami Cigar, MyFather, Oliva, Quesada, RomaCraft, Tatuaje by Stace Berkland. Bookmark the permalink. Thanks Steve, that UF-4 is really something special.